The Indian retail sector is growing faster than ever before and is one of the fastest growing in the world. According to a Deloitte Report, the Indian retail industry is expected to grow to US $1.1 trillion by 2020, registering a CAGR of 8.79 percent between 2000 and 2020. This growth can be attributed to the growing young population of the country, rise in disposable income, change in lifestyle and most importantly, digitization and connectivity. Though brands are investing heavily in online retail, traditional retail continues to be their core focus and hence, demand for shop fit designers and manufacturers only continues to grow. 2018 was a redefining period for Indian retail industry. From huge investments by international players to M&A, downsizing of physical stores from traditional players to investing in physical stores by ecommerce players, the retail industry witnessed significant changes. As the debate around relevance and profitability of brick-and-mortar stores continues, retailers continue to invest in physical stores and thrive to provide the best shopping experience for customers. The traditional, one-size-fits-all store formats are slowly decreasing and brands are now continuously working towards exploring creative concepts to rejuvenate the look and feel of the store to stay relevant and attract their respective consumer targets. Every brand has a different approach in designing retail outlets and so are their shop fit requirements. 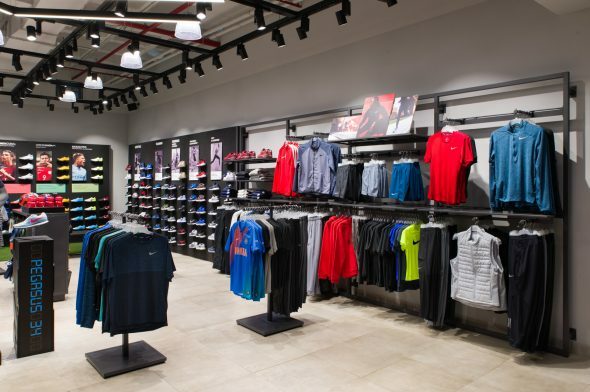 For example, a sportswear brand store will have a spacious interiors, relaxed furniture for seating, minimum product placement on shelves to create clutter free picking up of products and eye-catching digital display of celebrated sports personalities on the walls to influence customer’s shopping. Whereas, a clothing brand store for infants and children has shop fittings and fixtures of lower height making it easy for kids to select what they want and have popular animated characters all over the store. This is where the expertise of shop fitters come into the picture. Shop fitters play a very important role in building successful retail brands by planning, designing and manufacturing shop fit and fixtures that reflect a brand’s ethos. They closely work with the brands to execute their designs and ideas for Visual Merchandising. A study by JLL suggests that the country is expected to see the highest mall supply in the next three years (2018 – 2020) touching 19.4 million square feet. Due to the radical shifts in the consumption pattern of new-age consumers, brands see tremendous untapped potential in small towns and cities (Tier II and III) they will expand their footprints in these geographies and continue to invest in physical stores. Brands continue to focus on integrating online and off-line shopping and the concept of ‘Experiential shopping centers’ will gain importance. Physical stores will double as fulfillment centers to help process online orders. Like in other markets, the concept of BOPIS, i.e. “Buy Online, Pickup In-Store”, which gives customer the flexibility to shop (order) online and visit the nearest store to try the product and collect it may become popular among people. As customer shopping experience, engagement and purpose of the physical store becomes more crucial, brands will regularly invest in store design, interiors, shop fits and new concepts in order to differentiate themselves from competitors. A good fit-out raises a brand’s profile, efficacy and creates a positive perception about the brand. Hence, there is a growth opportunity for shop fitting industry. Adding to this, the trend of solo entrepreneurs entering the market and small scale traditional retailers who wish to revamp their business rely on professional shop fitters for retail store design, floor planning, shop fits, etc. which will also give a boost to the shop fit industry. As organized retail industry continues to grow in the country, it possesses a great opportunity for the shop fit industry. Decisions by brands to downsize the store formats may hurt the shop fit industry’s business and profitability, but there will definitely be significant growth as more brands are now looking to establish their offline presence and also increase their physical presence across markets. In addition to this, with the new rules regarding single brand retail ownership, many new foreign brands will look to enter the Indian market. Being an allied industry of the retail sector, the shop fit industry grows hand-in-hand with the retail industry. As brands continue to invest in visual merchandising and store design, they rely on experienced and quality focused shop-fit manufacturers to partner with them. The role of shop fitters cannot be understated in helping the retail brands build their identity, differentiate them from competitors and attract footfall in the store by their innovative designs and store concepts. Shop fitting is an important investment for retail brands and when done right can translate to improved business and performance. Overall, the outlook for the shop fit industry is positive.